Poreč is a town located in the heart of the western coast of Istria. A town of culture, tourism, sport and entertainment, it has been recognised and awarded for the beauty of its public spaces and its cleanliness many times over. Poreč grew from a small coastal settlement into an attractive tourist destination distinct for the great care put into the beauty of its public spaces, a wide variety of accommodation possibilities, a diverse offering of events and activities as well as facilities tailored to each individual guest. As the biggest tourist centre of Croatia Poreč has a wide range of accommodation possibilities. Among the many there are ten hotels equipped for conventions, seminars and other business meetings. Besides the multi-purpose halls and auditoriums for meetings, lectures and receptions with high quality equipment and staff (simultaneous translations, sound, slide and cinema projectors, videos, PC computers, fax, copy-machines, hostesses) the hotels also offer excellent catering services (banquets, cocktails, formal dinners, refreshment during breakes). In between and after business obligations there are many recreational possibilities inside the hotels (swimming pools, saunas, fitness and trim cabinets) and outside the hotels (gym, tennis courts, cycling tracks and other sport fields), entertainment (disco bars and casino), organized tours (Brioni, Pula, Central Istra and Venice) and cultural programs (concerts, exhibitions, museum). Žatika Sport Centre is a multi-functional hall in Poreč. 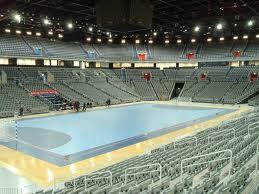 It was built for the needs of 2009 World Men’s Handball Championship, and formally opened on 21 November 2008. 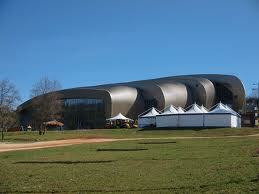 Total area of the hall is about 14,000 square meters, and has a total seating capacity of around 3,700 seats. Playable area is 50 x 50 meters - 2500 m2. Apart from the big hall, there is a small hall with 213.40 square meters and a fitness hall of 86.26 square meters on the same level with the main courts. Along with all following contents, there are restaurants and a great number of temporary objects for events and fairs. An original Franciscan Gothic church built in the 13th century that was rearranged in a Baroque style in the 18th century. 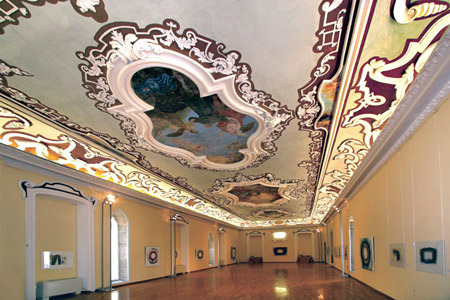 Today it houses exhibitions and concerts, and in the last century it was the seat of the regional parliament. Playable area is 9,2 x 20,8 meters - 191 m2. Its attractive location allows guests of Poreč the possibility of visiting other important localities within its vicinity: one of the most beautiful cities in the world, Venice, the Brijuni National Park, the Baredine Caves, the Roman Arena in Pula, the Pazin Chasm and the Lim Fjord. Grand Istrian tour – Istria is Croatia’s largest peninsula. This area will attract you not only by it’s coast, but also by the lovely and varied inland – romance, mystic and simple beauty will wait you here. Visit the most picturesque and important small cities in Istria- picturesque Motovun placed on the top of the hill, breathtaking Rovinj with the Lim Fjord and Pula with Roman Amphitheatre. Excursion to Pula - The largest town on the Istrian peninsula offers a diversity of attractions to lovers of culture. While strolling through Pula you will come across numerous monuments of Roman architecture: the Triumphal Arch of the Sergi from the 1st century B.C., Hercules’ Gate and Twin Gates, the Temple of Augustus, Arena and Small Roman Theatre in the town centre. Excursion to Brijuni National Park – Brijuni Islands National Park offers an experience of cultural, historical and natural attractions in a very unique way. Guided tour of the island includes safari park, numerous exhibitions, remains of Roman and Byzantine archaeological sites as well as an insight into the rich plant and animal life. Excursion to Venice, Italy - one of the most beautiful cities in the world and the jewel of the world heritage. Passing numerous monuments and sights (Bridge of Sighs, Ducal Palace, church of St Mark), unforgettable witnesses to Venetian glory, culture and power, strolling picturesque streets and crossing bridges you will feel the strength and power of once famous Venetian Republic. Visiting one of the workshops where famous Murano glass is produced will present a unique experience. Food and Wine - Istrian gourmet tour – Traveling in any new region, cuisine is a perfect way to capture the essence of the place. With diversity at the heart of Istria, you’ll delight in new culinary experiences and reconnect with traditional flavors. We invite you to discover Istrian rich gastronomic heritage, the best olive oil and wine producers, restaurants and taverns. Join us in exploring forgotten flavors and traditional techniques, as well as sophisticated, trendsetting preparations.